There is no ‘great bond mispricing’ in the US. The theory is that taper talk prompts dumb money to sell safety, and the smart money — which knows there’s no such thing as underpriced principal safety these days and that taper implies risk-off — to pile into safety at an even faster rate. The price of treasury securities is set – via arbitrage – by the short-term interest rate on the money market. The different maturities are connected via arbitrage, too. Bond prices and therefore effective yields are not set by central banks of emerging economies and the interactions of supply and demand. They are set by the Fed and by market makers ‘playing’ the yield curve. 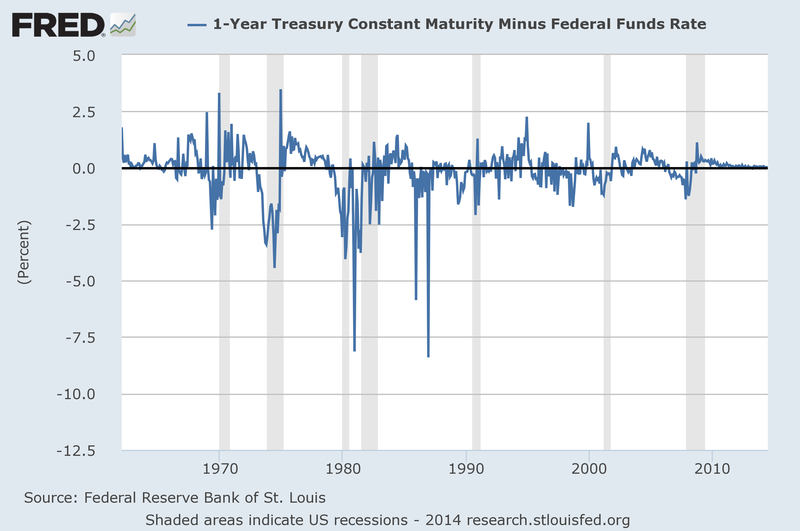 As long as the Fed’s interest rates are low, the price of US treasury securities will not go anywhere. That does not mean that you cannot make money in the bond market, obviously. However, I’d argue that the closer the line of the graph above is to zero, the less money you can make. Sovereign Bond markets have been boring (while people shouted: “Hyperinflation”), are boring (“Debasement of the Dollar!”) and will be boring for some time (“The Great Bond Mispricing”). If you want action, look at ‘sovereign bonds’ denominated in foreign currency drafted under foreign law.